Nature Knights Xtreme Adventure Sports Event – Big Rappelling Over the highest Cliff Hanger of Maharashtra Standing at 4670 feet above sea leve; Konkan Kada Total Rappelling length over 1800 feet. The event is executed under guidance and supervision of expert mountaineer supported by an experienced and skilled team. Corporate and Groups can book a full batch..
Get set for the most thrilling 1800 ft rappelling of your life !!! Extreme Adventure Fee: Rs.4250/- per head. 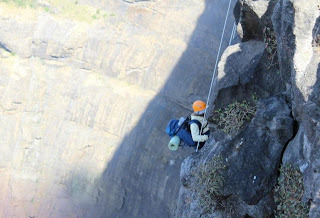 Rappelling along with all safety equipments; procedures and expert support. Veg Meals – One Breakfast before start of rappelling; One Packed Lunch on rappelling day after descending to base village. Travel cost beyond the scope mentioned of what’s is mentioned above. Prior experience in rappelling required. Harishchandragad is a hill fort in the Ahmednagar region of India. Its history is linked with that of Malshej Ghat, and it has played a major role in guarding the surrounding region. The height of the fort is 4671 ft MSL. The most interesting point on this fort is this cliff, which has always fascinated many people from many years. The cliff faces west and looks down upon the Konkan. From here, one can have a breathtaking view of the surrounding region and the setting sun. This cliff is not just vertical, but it is an overhang, almost like a cobra's hood. The Konkankada, a unique formation in the Sahyadris, is really tough and a challenge for the trekkers. This is a semicircular cliff of about 2,000 ft straight drop + 1000 ft slant fall in the Konkan plains. The surrounding grandeur and beauty of the plains and the mountains leaves us totally spellbound. It is one of the highest direct fall cliffs to be found in Maharashtra and Western Ghats. This is a combination of thrill and bliss that every true adventurer would say ‘YES!! !’ to… Rappelling, also known as abseiling is an act of descending a mountain face by sliding down a rope, which is attached to a body harness and fastened to an overhead projection, with sufficient friction provided as to make the speed of the descend controllable. 10:50 pm Board train to Kasara from CST. 01:30 am Arrive at Kasara at 1:30 am; transfer to Base village Paachnai, by private transport. Breakfast, Morning 6 am, participants will start rappelling. 07:00 am Rappelling starts (Your turn will start based on your roll call). To rappel the Konkankada atleast once in a life time is a dream of almost every adventure freak in Sahyadris. 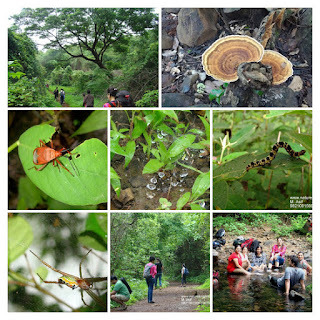 It is the most thrilling and spellbound activity offered in the Sahyadris range. Rappelling will be conducted in 4 stages to complete 1800ft. Lunch will be served at 1:30 pm and those who reach by night, will be served dinner also at extra cost. Glucon 'C' or 'D', 'Enerzal' powder, personal medical kit, extra Optional - Cap, goggle, spoon, slippers, knife, snacks, fruits, towel etc. Note - Prior experience in rappelling required. It is up to the individual to arrange their own holiday / accident insurance and; each adult would be asked to sign a liability waiver. In case event place or venue is changed, organisers will notify same to participants by phone, web and Face book, no change in costing will be charged. In case of cancellation of event, money will be returned to those who have enrolled, without any cancellation charges. Smoking and Drinking alcohol during trek is strictly prohibited if anyone found doing that will be expelled from trek without refund.